Applicant 2: TripHunter is an online travel search engine that shows the cheapest way to travel from point A to point B, which involves a combination of buses and trains in the UK. Applicant 3: GenU.i.n.e will be an ethical children’s clothing company without gender stereotypes. Applicant 4: GapWith is a mobile and internet platform that allows explorers to live feed their experiences to people watching all over the world. The application will allow people who don’t have the time or funds to travel, to be with the people who can, free of charge. Applicant 5: Will provide a service that allows students to book each part of their night out in a particular city, all in one place. This may be a huge night out package or just a nightclub entry and taxi ride home. Applicant 6: Caregiving will be the UK’s leading online platform to help families find trusted, quality and affordable care, as a one-stop caregiver sourcing platform. Caregiving is an umbrella term which may encompass any form of health related personalised attention. Applicant 7: FuseMind is a new kind of academic search platform challenging all current dogmas. Applicant 8: The SanEco team have used their entrepreneurial skills to design a novel, non-electric refrigeration system which can give back the 40% wasted crop to farmers. Applicant 9: PortQuays will create an app enabling students to help ease their property selection. Applicant 10: JuaMaji, meaning ‘SunWater’ in Swahili, is an innovative solar distillation tent. Our project helps local entrepreneurs in Kenya and Malawi construct these solar distillation tents, empowering them to provide their entire community with a reliable source of clean water, while simultaneously running a sustainable fish farming business using the same tents. Applicant 11: ‘EthiCo’, is offering consumers an affordable and carefully selected ‘essentials pack’ for living sustainably on campus. This product comprises a reusable coffee cup, reusable lunch box with cutlery, and reusable water bottle, all packaged in a reusable cotton bag. Once we have chosen the shortlisted projects, we will announce them on our Facebook page at fb.com/UnionSouthampton so stay tuned! 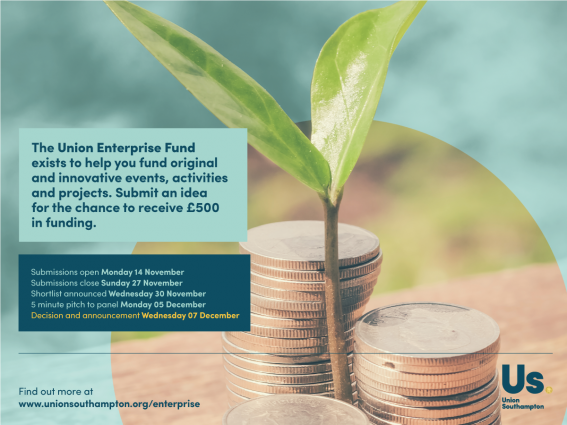 The shortlisted projects will have an opportunity to do a five minute pitch to a panel of experts where they can explain why their idea is deserving of the funding. We will then announce the winner on Wednesday 07 December! « Christmas Ballin’ – 8 Days to go!